Why Slowly Increasing Hormones Is Better Than Making Major Adjustments - Fit, Fabulous and Forty! Many women suffer from a hormonal imbalance. The symptoms can range from mild to being so drastic that they negatively affect their quality of life. Having a hormonal imbalance can make you feel like bursting into tears one minute and angry or irritable the next. It can make you feel too hot or too cold – even when you’re in a room with an appropriate temperature. You can experience muscle cramps, rapid or slow heartbeat, fatigue or incredible bursts of energy. A hormone imbalance can give you too much strength if your testosterone is too high or it can cause your muscles to be weak. There’s no doubt that a hormone imbalance can cause all kinds of different side effects – even to the point that you would give anything to feel better. What most women don’t realize is that fixing a hormonal imbalance isn’t an exact science. Your body doesn’t produce hormones in exact milligrams. Some days it uses more hormones than on other days. Things like your monthly cycle can also affect the levels. These levels will always ebb and flow, which is why, when you first get prescribed hormone pills, you can have an unpleasant reaction to it. Hormone pills are giving you a sudden influx of hormones rather than increasing them naturally as they’re needed – like your body is supposed to do. You might think that once you take the pill or patch or whatever your doctor gives you, that all will be well and you’ll never have to deal with the effects of the imbalance again. READ Urine Versus Yams - Which One Should You Use? 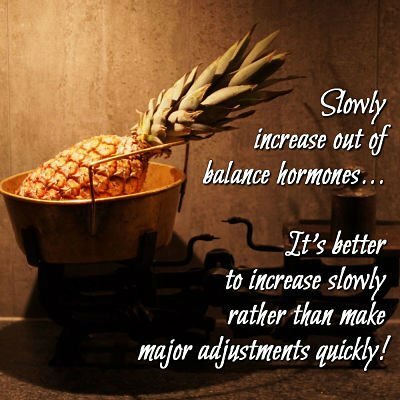 Your body isn’t made to handle yanking your hormone level up to where it should be when it’s been running on a deficit, especially if your hormones have been low for quite some time. If you suddenly introduce your body to higher amounts of hormone, and it happens to be too much, it reacts horribly to the influx. You can get side effects that are so severe, they can impact your ability to function. For example, women who have a hormonal imbalance with their thyroid who suddenly take thyroid replacement medication can experience extreme dizziness to the point that they feel like they’re walking sideways. Dizziness can be a problem and they can develop hand tremors. Vomiting, stomach cramps and diarrhea can also occur. Women who take too much estrogen needed to restore a hormone imbalance can react by having bloating, vomiting or even having portions of their hair fall out. When it comes to hormones, it’s always better to let your body adjust to smaller levels. If you take the smallest level possible and then slowly increase it, working your way up to the level that your body needs, you can avoid experiencing the major and often ugly side effects.